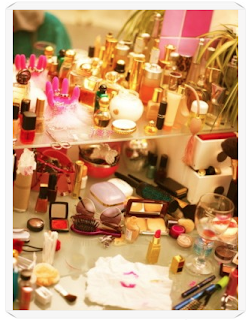 Blush Haus of Beauté: There is a little bit of a hoarder in all of us, especially when it comes to makeup. 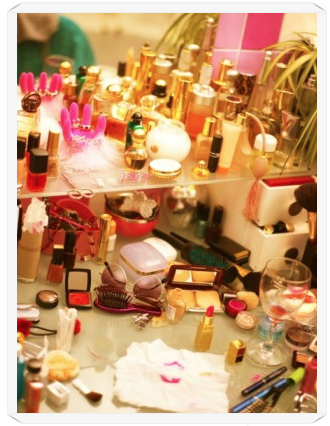 There is a little bit of a hoarder in all of us, especially when it comes to makeup. f you have to dig though drawers and rummage through an overstuffed makeup bag to get ready every morning, then it's time to bring order to your beauty stash. These tips will help you declutter your loot and streamline your storage space. Old makeup is disgusting. It may appear to be useful- but trust me amigo, it is not. It HOARDS bacteria-especially your mascara. That stuff is just waiting to attack you with an eye infection. Evil little thing it turns into. Since it is it not possible to perform an Excorcism on your old beauty products (trust us, we've tried and let’s just say those demons won), here are some reminders to know when your makeup has a date with the garbage. Smell. If your makeup even remotely starts smelling odd/different, then you know what to do. Mascara especially will develop an odor from all the bacteria gathering in the tube. Don’t commit makeup suicide. Ditch that sucker and buy a new one. If you are using a brush for your foundation, liner, brows, blush, etc- you must remember to wash your brushes/applicators THREE TIMES A WEEK. We recommend buying a brush cleaner Jane Iredale's Botanical Brush Cleaner. In order to keep your skin healthy and brushes free of bacteria, it is essential to treat them with care- and cleaning them with the correct products will keep their integrity. NEVER use hot water, or simple soap. This will damage the bristles on your brush. You own a lot of makeup, and you aren’t sacrificing any of it. We recommend turning your bathroom into a closet for all your products. See-through compartments with drawers are the best for organizing. Place all your face (foundations, concealers, blush) into a drawer, eye products (shadows, liners, mascaras) and lip (liners, gloss, lipstick) into separate drawers/compartments. Remember to keep all your brushes together. Maybe place your brushes in clear glass where the bottom of each glass if filled with colorful glass beads. It will keep the brushes in place and esthetically looks amazing. Men hate seeing an abundance of what they view as “junk”. (We know it stings to know their opinion of the products we live by). If your space to get ready is combined with your man, we suggest (he shut up and deal with your need to be glamorous) you invest in a makeup kit/case which will hold ALL of your beauty needs. Go browse and pick what from what you need; wheeled, zippered, hard cased/soft cased. It is like buying a new car, so take your time. It is important to choose an option which once opened will have enough space for your brushes, makeup products and can even fit cleansers/moisturizers as well. Once you purchase your makeup case, pack all your beauty products into categories and place your case wherever you desire (this case will help traveling with your products much easier as well). DO NOT NEGOTIATE A SPOT. He already made you lock all your stuff away, he can’t take your freedom. These tips should help you regain organization with your makeup and make everyday looks easier to obtain. It is also the perfect opportunity to go makeup shopping- what is better than that? It's all in one Haus! Look. Great hair never goes out of style. It can be a compliment to your look, or the centerpiece. It shouldn't be basic just because you wear it everyday. For just that reason, it should be anything but. Embrace it.